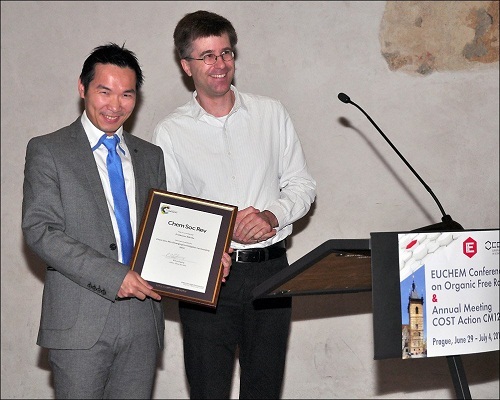 Professor Xile Hu, of the Ecole Polytechnique Fédérale de Lausanne (EPFL), Switzerland, was the winner of the Chem Soc Rev Emerging Investigator Lectureship 2013. Professor Hu chose to give his award lecture at the recent EUCHEM Conference on Organic Free Radicals, which took place at the end of June. He was also presented with his Emerging Investigator certificate at the event. Congratulations again to Professor Hu! The Emerging Investigator Lectureship is an annual award which recognises an emerging scientist who has made a significant contribution to their research field. Nominations for the 2015 award will open later in the year – watch this space.